Backup Office 365 files including email, contacts, calendars, settings and other important data. Secure, easy-to-use and simple to set-up using a single pane of glass SaaS-based solution. Your Office 365 data is safe and in compliance with regulatory requirements using Dropsuite Backup & Archiving. Backup SharePoint, OneDrive and Teams Sites files for no additional cost with Dropsuite Email Backup and Archiving. Maintain complete copies of critical business data to ensure protection from hackers, encryption malware, accidental deletion and more. Keep complete records of files and easily restore them with the one-click restore feature. 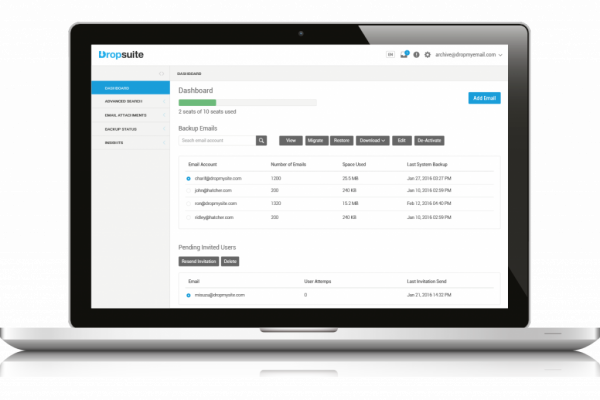 Dropsuite offers advanced email archiving included in our Email and Archiving product for no additional cost. Comply with regulatory and legal requirements. This powerful and extremely easy to use archiving includes; Advanced search, eDiscovery, Audit Trails, Legal Hold and much more. All of these are administered in a single pane-of-glass dashboard making administration easy and fast. Website backup that’s simple, powerful and comprehensive. Backup includes all website files, directories, databases and scripts. Easy to use dashboard makes setting up and running automated backups fast and simple. One-click restore means your website is instantly available in the event of a hack attack or other data loss reason.